I knew that there would be some repercussions. When KB and I got together to work on concluding the tracking for “Get Up“, we did lots of shout-y background vocals, some other-worldly guitar noises, and liberal amounts of Kaossilator. We were left with just one thing to record: a stomp-clap part reminiscent of Queen’s “We Will Rock You”. We considered using some loops, but decided that it would be more satisfying and potentially better-sounding if we recorded something ourselves. Plus, it would be some fun sonic experimentation! After throwing around ideas about what we could stomp or bang on (empty coolers, amp cabinets, furniture, pets), we realized that the biggest instrument available was underfoot: the house. In particular, the stairs down to the Snoozeking lair are a fantastic example of what I like to call “cajón natural”. A huge wooden box that we could stomp on. So we mic’ed it up. And we stomped on it. 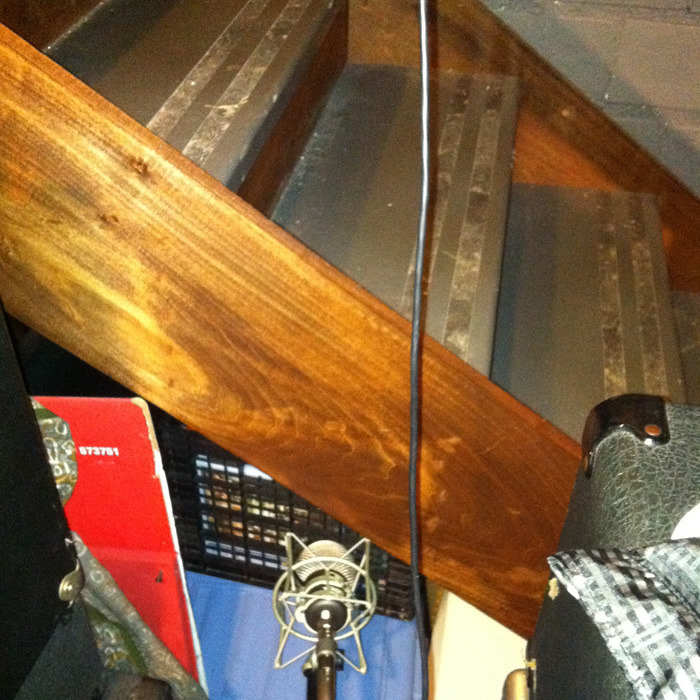 We set up a ribbon mic under the stairs (amidst crates full of puzzles and boxes of photos), and we had a room mic for clapping and the clothes dryer (which we determined rocks out in C). Sharing one earbud each from a pair of iPod headphones, KB and I did a few takes of stomping and clapping. Initially the results seemed… weak. Until we employed the magic of post-processing, we thought the cause was lost. But with some compression, distortion and EQ we got what we were looking for. In this case we used the Decapitator plug-in from SoundToys (and I can’t say enough about what a worthwhile investment their plug-ins have been). In the end it turned out to be just what we needed to give the chorus of the song that extra kick. And we were also able to feature the “stomp” a little bit when we break down the last chorus. Check it out and let us know what you think!